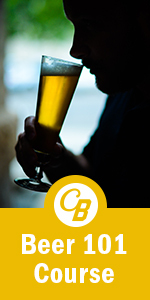 Craftbeer.com has “crafted” a class that helps us beer drinkers talk like pros when it comes to barley, hops, water, and yeast and helps us make good decisions regarding our beer selections. Here at Weblogbeers, we spend a lot of time on beer research (drinking) to gain knowledge, but a little book learnin’ could hurt. The CraftBeer.com Beer 101 Course is an online course created for anyone. It’s an introduction to craft beer from the leading organization representing America’s small and independent breweries. Beer 101 costs $20 and you get a certificate of completion to substantiate your knowledge. It takes about an hour to complete the course from your personal computer. Now before you get too excited, there is a test!. That’s right you have to pass a 21 question quiz at the end of the course. Once you start the quiz you have 20 minutes and you must get 75% or higher to pass and receive your certificate. You can retake the test if you don’t pass for a full year before having to re-register. So there’s little chance you won’t pass and download your printable certificate of completion. Go to https://www.craftbeer.com/beer/beer101-course to get started or email beer101@craftbeer.com for questions or comments. 5 BeerBobs for this course. Know your beer! This entry was posted in Uncategorized by weblogbeers. Bookmark the permalink.